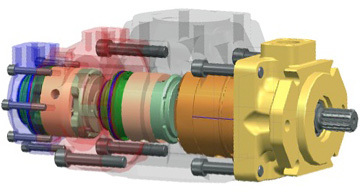 Configure Denison Hydraulics Vane Pumps Yourself! On vanepump.eu you can easily configure the genuine Denison Hydraulics single, double, or triple vane pump that perfectly fits your requirements ... and that with just a few clicks! At the browse vane pumps section you can select a wide range of basic and advanced filters to narrow down your selection to the vane pump that is best suited for your application. Basic filters are displacement volume and pressure, whereas the advanced filters range from various shaft and mounting options to different type of seals or other specific requirements. The large variety of available options allows for customized installation, which you can now easily configure yourself with the Denison Hydraulics Vane Pump Configurator. 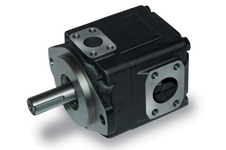 The genuine Denison Hydraulics vane pump operates at 94% efficiency under high pressure, which increases productivity and reduces heating and operation costs. 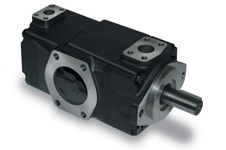 The Denison Hydraulics T-Series vane pump comes with numerous application advantages, which are summarized by Parker Hannifin in the list below. High pressure capability up to 320 bar. Wide speed range (400 rpm - 3600 rpm). Allows application in cold environment. Designed with low noise level characteristics. High resistance to particle contamination. Customized installation with large variety of options. As Certified Distributor Hydraulics by Parker Hannifin we supply original spare parts for all the Denison Hydraulics T-Series single, double and triple vane pumps. 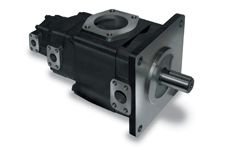 The genuine Denison Hydraulics vane pump is produced by the Vane Pump Division of Parker Hannifin. The Vane Pump Division Europe (VPDE, Denison) is headquartered in Vierzon, France and manufactures for the greater EMEA area. Damen Technical Agencies B.V. is a specialised engineering sales company that stocks and supplies various hydraulic parts.